Machiste finally has his kingdom back, but all is not well for Mariah cannot seem to stop thinking about Morgan, of course this being unknown to the king of Kiro. Mariah longs for Morgan and she knows that it is unfair to Machiste and thus, with a newly forged sword and a magic love charm given to her by someone at the market, she sets out to find a wizard who might teleport her to Morgan’s side. 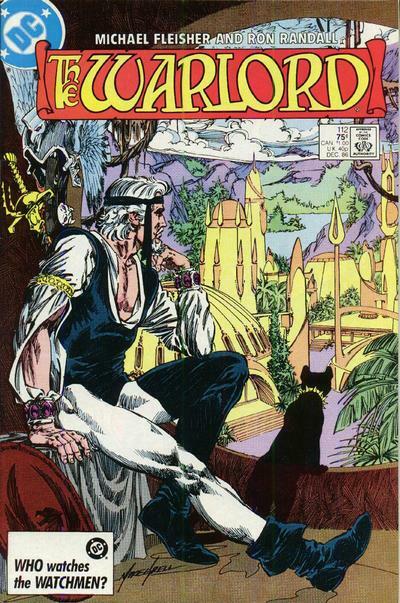 Michael Fleisher and Ron Randall meanwhile keep Morgan and Shakira’s hands full with danger and drama galore. After losing their submarine to a watery menace, the couple finds themselves seemingly under attack by men on horseback. The men believe that Shakira is their princess and that Morgan is her abductor and they mean to get her back by any means necessary. Through a series of events, the real princess is found and everything is set right with Mariah meeting Morgan and Shakira out on the other side. This issue changes everything by the little cliff-hanger that Fleisher leaves it on. For the longest time, everything seemed to be just fine, or as fine as it gets, with Machiste and Mariah, and now there is trouble in paradise and Mariah realizes that Morgan is the man for her. He was the first man that she fell in love with while in Skartaris and supposedly only took Machiste as a consolation prize. It is a little strange that she would go back to Morgan as she knows that he loves Tara and up until this point, Mariah seemed really happy with Machiste, and in love to boot. How this will affect Morgan’s quest to save Jennifer and his relationship with Tara is up in the air at this point, but it will quite interesting to see how it all pans out.